Semi-arid climates provides a unique set of challenges for site design, maintenance, and gardening. 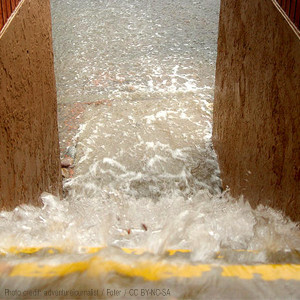 Santa Fe averages 14″ of rainfall annually, but annual rainfall can vary greatly from year to year. Most of Santa Fe’s precipitation arrives from July to early September during monsoon season. Soils in drylands may shed water rapidly causing flooding and erosion. Soil structure and composition, lack of organic matter in the soil making soil less spongy, minimal surface cover by vegetation, and other factors contribute significantly to runoff and erosion in drylands. Since much of our annual rainfall can arrive in episodic, intense storms, water harvesting structures for storage or distribution should be sized to accommodate a large volume of water. Water stored in structures such as cisterns, or in the ground in French drains, pumice wicks, or swales will help plants survive extended dry periods during the rest of the year. In moderate, moister climates with periodic, gentler rainfall, gardeners may not have to worry about storm water storage because soils are often spongier, and better able to absorb and store more water for longer periods of time. Plant cover is usually denser protecting soil from evaporation and wind erosion. Extended drought can winnow out plants that are not well-adapted to this landscape so that only the hardiest, drought-tolerant plants survive without excessive care, but a landscape supported by harvested rain water will be more resilient. Fortunately, there is a wide variety of native and adapted species that are hardy, drought-tolerant, and beautiful. Your thriving drylands garden will require less work and maintenance if you select appropriate species for your site. Ask us about water harvesting techniques and beautiful native species that will thrive in your New Mexico garden.